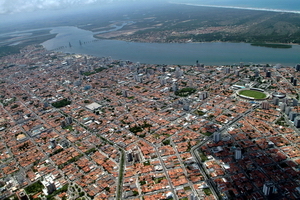 Aracaju was planned to replace São Cristovão as the new capital of (then province, now state) Sergipe. In 1855 the transfer was made. At present, Aracaju hosts about 600 thousand inhabitants. 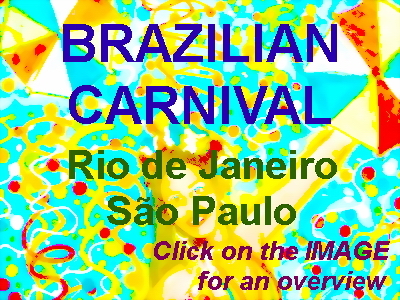 The city is famous for its beaches (Atalaia and Mosqueiro), festivals (Pré Caju and Forró Caju) and local dishes. Nearby São Cristovão is the fourth oldest city in Brazil; the São Francisco Square was added to the UNESCO World Heritage List in 2010. Other nearby historic cities are Laranjeiras and Estância. 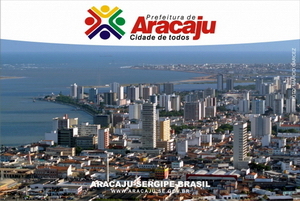 Aracaju is the capital of the state of Sergipe, Brazil’s tiniest state. The state is surrounded by Bahia in the south and west, and by Alagoas in the north. The state is limited by the Atlantic Ocean, in the east. The coastal region of Aracaju contains several pristine beaches, and some urban beaches, of which Atalaia is the most widely known. The city of Aracaju counts 181 square km, the average height is 4 meters. According to numbers of IBGE (2011), the city hosts about 580 thousand inhabitants. The Human Development Index is a little below 0.8 (0.794). The name ‘Aracaju’ is derived from the indian Tupi words ‘ará’ (parrot) and ‘acayú’ (fruit of the cashew tree). Hence, Aracaju may be translated as the ‘cashew tree of the parrots’. Not long after the discovery of Brazil by the Portuguese expedition led by Álvares Cabral in 1500, the region of actual Sergipe became a site of various fights between the indians, African slaves, and invaders from European countries other than Portugal, predominantly French colonists. The Portuguese Court recognized the importance of stability and peace in this region, and ordered a Portuguese expedition force, commanded by Cristovão de Barros, to make an end to the hostilities. The location of actual Aracaju was the residence of a cruel and feared indian chief, named Serigy. He, his brother Siriri, and his people were attacked and defeated by Cristovão. Serigy and Siriri were killed. On January 1st 1590, Cristovão de Barros founded the city of São Cristovão that became the first capital of the capitania of Sergipe. The city is the fourth oldest of Brazil. In 1637, the city was attacked by Dutch invaders. The Portuguese-Spanish defenders ordered the cilivians to leave the city and set fire to the plantations. The Dutch entered the deserted city and destroyed the remainders of the city. At the end of the seventeenth century, Sergipe was annexed by Bahia, and became an independent province again in 1820. São Cristovão again became the capital. There were intentions to move the capital to the Atlantic coast, in order to have more port facilities for the export of cane sugar, the most important export product at that time. On March 17th 1855, the capital of Sergipe was transferred to the newly-built city of Aracaju, according to the proposal of Inãcio Joaquim Barbosa, the first president of the Province of Sergipe del Rey. Aracaju is considered as one of the first planned cities in Brazil. The location of Aracaju was almost uninhabited until 1699, when a settlement was erected, with the name Santo Antônio de Aracaju. In 1855, at the time of the transfer of the capital, only a few buildings were constructed near the port of Atalaia. 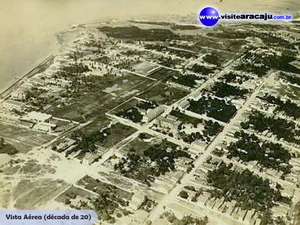 IT was not until 1865, when Aracaju had some structure of a small city. In June 1886, Aracaju counted 1484 inhabitants. Pavement of the principal roads and the construction of the sewage system started in 1900. The responsible engineers decided to adapt the checkerboard pattern for the newly-planned city, according to similar structures in Washington, Canberra, Buenos Aires, and Chicago. At the start of the seventies of the past century, Aracaju had established itself to a secure city, with adequate infrastructure, nice beaches, and friendly people. Only a few tourists arrived at that time. Since the foundation of EMSETUR in 1977, tourism has boomed, and so did the tourism industry. 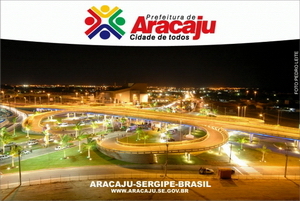 In 2010, Aracaju contributed for 42 percent of the entire economic activity in the state of Sergipe. In 2009, economic activity in Aracaju consisted of services (80.8 %), industries (19.0 %), and agriculture (0.2 %). In only six years, between 2004 and 2010, the economic activity in Aracaju grew with 53 %, the fastest growing capital in the northeastern region of Brazil. It is projected that the economic growth will continue and may at least triplicate in 2025. Most of the economic activity in the services sector is derived from tourism. Modern services as telecommunications and information technology are expanding. The industrial sector consists of textile industry, cement production, and fertilizer production. Aracaju is located at the Atlantic Ocean and hosts about 35 kilometers of beaches within the city limits. The principal beaches in Aracaju are: Atalaia, Aruana, Robalo, Náufragos, Refúgio and Mosqueiro. Atalaia Beach is the nearest to the city center and is considered as a postal card of Aracaju. The six km beach is flanked by the Orla de Atalaia, which contains a mixture of trendy bars, restaurants, comfortable hotels, and night clubs. The Oceanário, with the shape of a turtle, counts 20 aquariums with local fluvial and marine flora and fauna. One giant aquarium shows marine life at larger ocean depth. Local artesanato – handicraft – may be found at the Centro de Arte e Cultura de Sergipe. 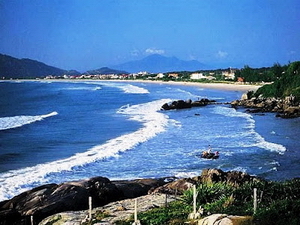 In the south is Mosqueiro Beach, where the Vaza Barris River meets the Atlantic Ocean. This beach is known for its nature, the mangroves and clean water. At low tide, small islands emerge from the sea. Tourists may visit the floating restaurant for delicious seafood. The historic center of Aracaju recently has been revitalized. The center contains some mansions of the 19th century. There are two markets, Antônio Franco and Thales Ferraz. Both markets recently have been transformed into a center of culture and leisure. Local handicraft may be encountered there. Another location for handicraft is at the Feira de Artesanato at Praça Fausto Cardoso, the oldest square of Aracaju. 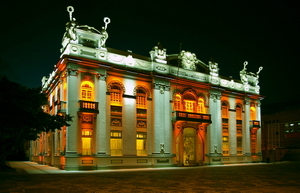 Until 1995, The government of the state of Sergipe was seated in the neoclassic Palácio Olímpio Campos, (click here for a 360 degrees tour) inaugurated in 1863 and now a historical museum, showing the history of Sergipe. In 1860, only five years after the foundation of Aracaju, emperor Dom Pedro II visited the capital. For this reason a landing was constructed, the Ponte do Imperador, along the Sergipe River. This landing has undergone several drastic reforms and now is one of the postcards of Aracaju. The oldest church in Aracaju is the Igreja Sçao Salvador, constructed in 1857. A cathedral was constructed five years later, the Catedral Metropolitana, in a mixture of Gothic and neoclassical style.The cupola of this cathedral is ornamented with paintings of the nineteenth century. 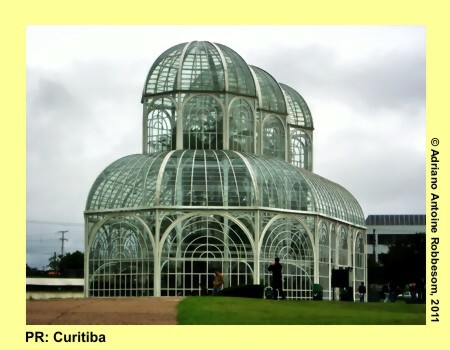 More photographs of Aracaju: click here. Two major festivals take place in Aracaju. Two weeks before Carnival, the Pré Caju, a so-called micareta, takes place. Almost one million enjoy the music of Brazilian artists of the northeastern region of Brazil, like Ivete Sangalo, Chiclete com Banana, Harmonia da Samba, Asa da Águia, Maysa Reis. In June, Aracaju is transformed in the City of Forró. Most of the activities at the Forró Caju happen at the Orla de Atalaia, where Brazilian artists as Zé Ramalho, Elba Ramalho, Calcinha Preta, and Calypso will have their shows. The state of Sergipe is more than Aracaju. The former capital of Sergipe, São Cristovão is the fourth oldest city of Brazil. Despite its destruction because of the Dutch invasion in 1637, the city had been completely rebuilt in the 18th century. Landmarks in this city are the Praça São Francisco with the Igreja (church) and Convento São Francisco, in baroque style. The Praça was added to the UNESCO World Heritage List in 2010. For photographs of São Cristovão: click here. Another historic city in the proximity of Aracaju is Laranjeiras. Already in 1530, a small port was constructed, along the Cotinguiba River. Only in 1700, the first church was constructed by the Jesuits. Most of the monuments are dated from the 18th and 19th century. Laranjeiras is considered as Brazilian Heritage because of the preservation of the colonial architecture. For photographs of Laranjeiras: click here and here. Another historic city with a good preservation of the colonial architecture is Estância, at about 70 km from Aracaju. This city is located at the Atlantic Ocean and shares its border with the neighboring state of Bahia.